I am involved in a lot of projects, perhaps too many. Fortunately, this page is limitless, so I can post about as many as I want. This is one of my projects I am most passionate about. Three times a year, I team up with Monique Mezzetesta to run a workshop for children of all ages that focuses on non-classical orchestral playing. For example, while performing some circus music, we hired an acrobat to conduct the ensemble with his juggling performance. Last workshop we hired rappers and beat-boxers to teach the kids their respective skills, which culminated in an orchestral hip-hop performance. The focus is always on fun and creativity. 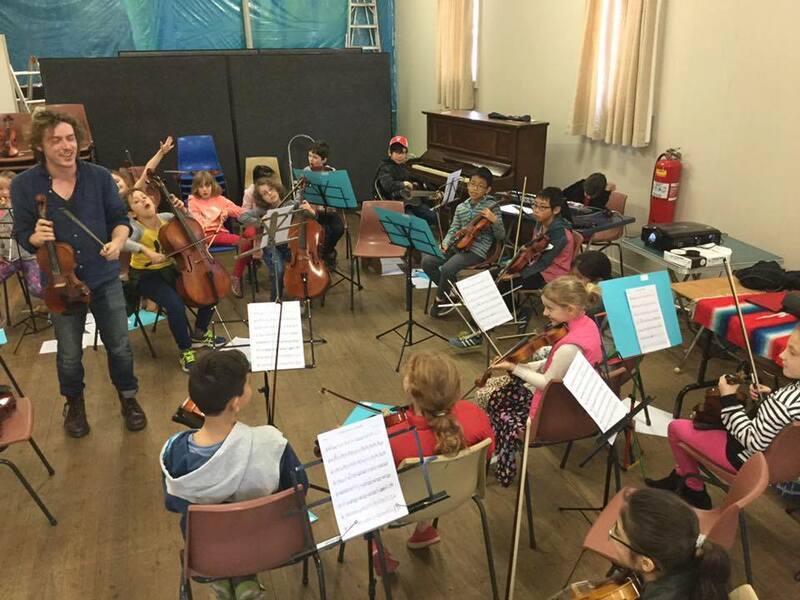 Rather than simply performing a classical piece, our workshop encourages to students to engage their creative minds, and specifically focuses on interactive performances, for example, collaborating with acrobats, hip-hop artists and even recording a radio play to be broadcast in children's hospitals. Or else, have a look at students composing and performing their own soundtrack to Matisse Gonzalez’s original Claymation short film; Planeta de Queso. The Squeezebox Trio are Michael O'Donnell, Thomas Hodson and Javen Sanchez on violin, accordion and acoustic guitar (respectively). We have toured their unique brand of gypsy swing all over Australia, as well as a six week tour of New Zealand on the strength of their debut album; "And A Hotplate!". We regularly performs around Sydney, usually for swing dancing events, often with a variety of special guests. Twice a year I choose an artist or band, and arrange their music to include a 20-piece orchestra. Past collaborations have included; The Crooked Fiddle Band, Ngaiire, Chaika, Lucy Wise Trio, Brian Campeau, Elana Stone and so many more.